We spent about three hours yesterday in the Uffizi, which is one of the most famous art museums in the world. Thanks to Marc Cenedella, we were taken around by a lovely art historian named Chiara who has forgotten more about Florentine art than I will ever learn. The kids complained a bit about the fact that we stopped at every important work and discussed it for five minutes, but for me it was the best. And the place was empty other than some florence kids on a school trip. It’s a great time of the year to visit Florence. 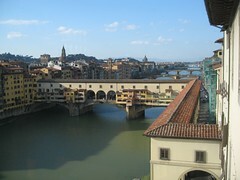 This photo was taken from the Ufizi Gallery and shows the private passage that the Medici’s built to take them from their palace, through the Uffizi, across the Ponte Vecchio, to their Pitti Palace. Very cool.